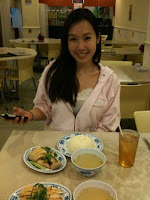 I was going to wait at least a few more months before making any posts specifically about Singapore dining. I wanted to make sure I tried out every worthwhile eatery in every corner of this Lion City before putting it in print (it's a small country, it almost seemed possible). But with friends from all over the world coming to visit Singapore and instead of retyping emails over and over again about my current favorite food stalls, I shall publish my recommended Shiok Eats list for the First Time Visitor. Start your day with a kaya toast breakfast. The Ya Kun Coffeestall is practically an establishment in Singapore. They have outlets sprinkled across the country, so finding a Ya Kun near your hotel won't be difficult. The toast is slathered with a thick chunk of butter and topped with kaya. Don't let kaya's green booger-like consistency turn you off. Kaya is a rich, sweet jam made of coconut milk, pandan leaves, eggs and sugar. Order a side of soft boiled eggs. Do it like a local and season your eggs up with pepper and sweet soy sauce to taste. Souvenirs: If you're not sure what to bring back home to friends and family, grab a couple jars of Ya Kun Kaya. I guarantee your mom will appreciate that more than a Merlion keychain. Singapore's best known dish, the chili crab is a must try. Shame on you if you've been to Singapore without having experienced fried mantou dipped in ooey gooey chili gravy. My personal favorite for chili crab is at No Signboard Seafood. While you're there, be sure to add on Cereal Prawns to your order. Go ahead and eat the prawn shells and all. When you're finished with the meaty sri lankan crab, mantou and prawns, be a total glutton and mix a spoon of the "cereal" with the chili gravy into a giant mouthful. I don't think the latter is a particularly Singaporean thing to do, but they should look into doing that more often. See this entry for more on my chili crab experience. If you're short on time, just grab the black pepper crab while you're at No Signboard Seafood. Otherwise, make room for Mellben's delectable, ultra succulent, supremely fragrant Black Pepper and Crab Bee Hoon. Black Pepper Crab is just as famous as its Chili Crab sister these days and for good reason. Beehoon crab is a less common dish amongst foreigners, but no less delicious. 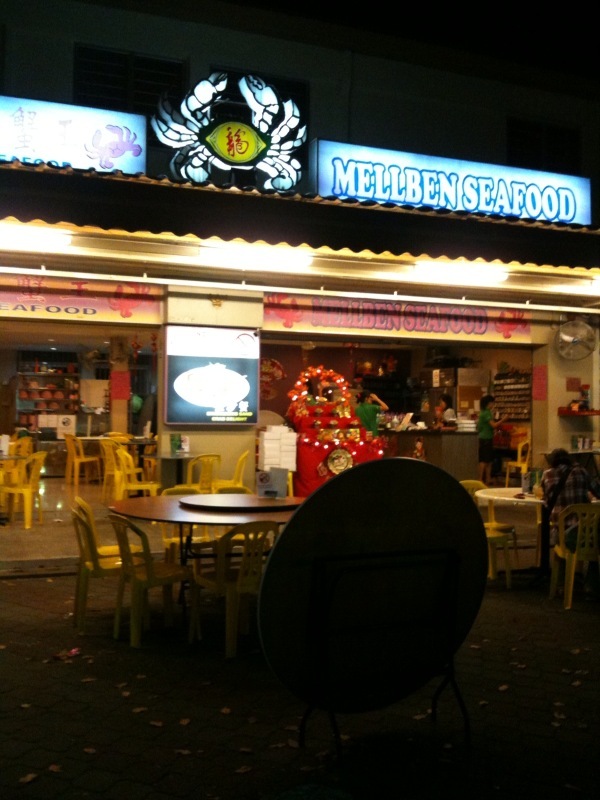 Mellben is the place to go for Crab Bee Hoon, a whole crab served in a claypot of noodles and spiced milky broth. 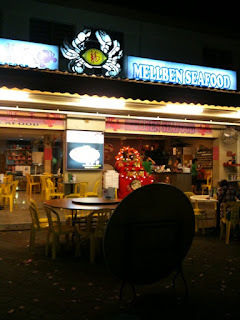 Long Beach Seafood also has good eats, but Mellben and No Signboard rocks its socks. Where NOT to go: Don't bother with the overhyped Jumbo Seafood. See this entry for more on my crab experience. EDIT: 2010 DECEMBER Tonight, I visited Singapore Seafood Republic at Resorts World Sentosa, where Jumbo Seafood's chili crab is also served. I retract my previous Jumbo-hate comments and would like to add Singapore Seafood Republic to the crab list. Jumbo's chili crab is a bit special, with their not so secret ingredient being peanut sauce--making the gravy richer and creamier. Singapore Seafood Republic also serves one of the only wines I know of that pair very well with white pepper, black pepper AND chili crab. Despite its Hainan title, the simple Hainanese Chicken Rice has long been associated with Singapore. The recipe was originally developed in Singapore by China's Hainan immigrants and today, chicken rice is listed as one of Singapore Tourism Board's Uniquely Singapore dishes. Much like the Cantonese, Malay and Thai variations, the key to the perfect Hainanese Chicken Rice lies in the aromatic rice cooked in chicken broth, ginger and garlic, and the cold poached chicken served with a side of ginger puree, chili sauce and thick sweet soy sauce. I've been to a number of popular chicken rice stalls (including Boon Tong Kee and Sin Swee Kee), but none hit the spot like Five Star and Yetcon does. I find that their chicken is juicy and packed full of flavor, and the rice isn't over cooked or overwhelmed with ginger. If you end up going to Yetcon, the well established traditional Hainanese restaurant, be sure to order the Hainanese pork chops as well. My usual is single portion breast meat (the meat is so juicy, you don't even have to go for dark meat!). If you have the tummy space for it, give the roasted version a try too. Five Star is open until 5am. Ultimate late night nomming. It's called XO Fish Beehoon for the exact reason you're wondering about. Yes, they use XO liquor in this broth and they use a lot of it. Self-proclaimed as the original creator of the XO Fish Beehoon, the owner only uses only the best of ingredients for his secret XO recipe. What inspired him to create such a dish? He was an XO salesman in a previous life! Founder, Ricky Lau has been commanding his Bee Hoon joint for 16 years and counting. This past February, he relocated his stall from Holland Village to the nearby Dover Crescent due to rising rental costs. Another absolute winner at this stall is their har cheong gai. The chicken is covered in a prawn based paste, then deep fried to order. As someone who isn't a huge fan of fried chicken (crazy, I know), it really says something when I wolf down all of Ricky's chicken every time I go. He never uses frozen wings--only fresh, and you can tell. The freshly fried batter never fails to crunch under the bite and the chicken meat is moist and tender without fail. To get an idea of how much I love this place, this past May I went three times in four weeks. Though teochew influenced, Bak kuh teh is another fabulous Singaporean dish. Havelock Road's pork bone broth is hearty and scrumptious, even in the humid Singapore weather. The pork bone broth is boiled with whole garlic cloves and a generous heap of black pepper until the bone marrow seeps into the soup. When serving, I keep it simple and usually just order a side of tau pok (deep-fried tofu), fried bread and giam cai (salted pickled veggies). There's always so much pork and the broth is typically refilled on the house, so slurp away! Personally, I'm a purist and I like it as simple as possible. I usually take my prata plain or with eggs and onion at most.. or when I have a dessert craving, I get my prata with bananas and condensed milk. Preparation is simple, but not very common within Singaporean homes (probably because it's so accessible and cheap outside). There is a process that includes flipping and stretching out the dough into a thin layer before it's cooked in a heavy douse of oil. Each order is usually served with a small bowl of chicken curry to dip the prata in. This particular photo was taken at 11pm on a Monday night. And it was really that crowded! It's one of my favorite comfort foods in Singapore. The place is huge, but expect a slight wait or relatively slower service on weekend nights. I've also found out that service got significantly better after I asked to take photos of the staff. They love it! Undoubtedly, the first time visitor makes at least one shopping trip along Orchard Road. And like all SE Asian malls, Singapore is no exception when it comes to good food at their food courts (America, you could learn a thing or two on this!). One very well known stall has a location inside Wisma Atria (can anyone say HOORAY for air conditioning?). 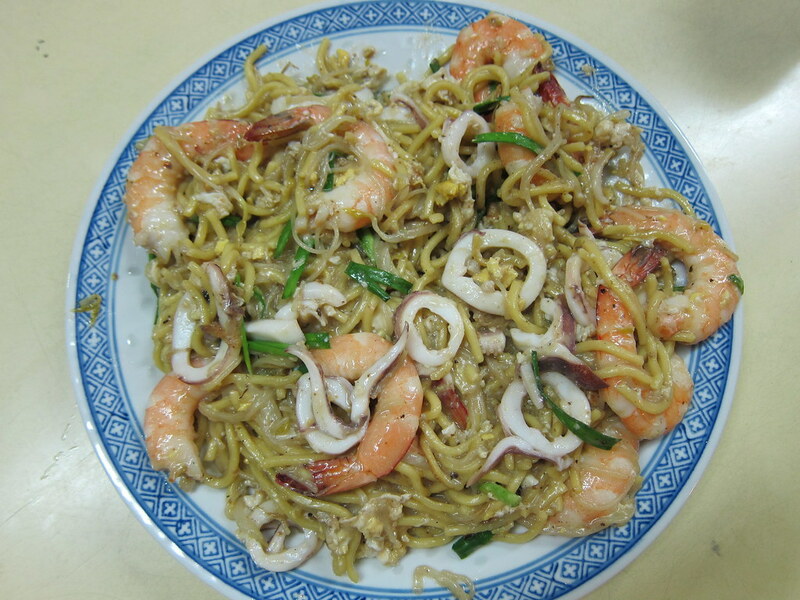 Here, you can get some of the best hokkien mee in Singapore. For Laksa, Katong is the way to go. This Peranakan dish is a spicy coconut-based noodle soup and another Singapore classic. The vermicelli is typically cut up into smaller pieces so the whole dish can be eaten with a soup spoon instead of chopsticks. The first time I tried laksa was actually in New York. My Singaporean friends had a small dinner gathering an apartment and grabbed a box of Prima Foods Laksa (Prima might be semi-instant food brand, but it's one of the best ways to get a taste of Singapore outside of Singapore). I've fallen in love with the dish since. After finally trying the real deal in Singapore years ago, I haven't been able to stop getting frequent cravings for it. Major comfort food. Personally, I'm one of the very few people who aren't fond of otak otak. But there has to be a reason everyone else loves it! Order the otak and give it a try. Otak otak is fish cake wrapped in a banana leaf and grilled over a charcoal fire. Even if I protest, I know the first time tourist will go ahead to Newton Circus at some point. Some of the stalls tend to be on the pricier side and most of them are subpar in quality compared to the hundreds of other options around Singapore. Nevertheless, Newton does have a huge range of options until late at night and some of them aren't so bad. If you find yourself stopping by Newton, please don't do something silly like order chili crab. Save that for somewhere else! Grab a plate of Sambal Stingray, deep fried baby squid and black carrot cake. I should note that the original stall of the hokkien mee place I mentioned earlier is actually in Newton as well. I remember the first time I heard of stingray as a dish. Back as a sophomore in college, I was at the New York Aquarium with my friend, Ambrose. We reached the petting tank full of sting ray. He stared into the pool and loudly went "mmmmh! Yummy!" whilst rubbing his belly. I looked around looking to see maybe a shark tank or maybe some fluke in a tank nearby. He pointed to the stingray. I looked back at him incredulously. Today, I'm still no stingray connoisseur, but I do enjoy the dish. My guess on the secret to what makes a good BBQ stingray has nothing to do with the animal, but moreso the sambal chili. The fish is BBQed on a banana leaf, then topped with a generous douse of sambal chili. Perhaps the best part about stingray is that it has the texture of a soft white fish, but without the hassle of any bones! Which stall in Newton? To be honest, I'm indifferent to the choices for stingray amongst the stalls there, so take your pick! Same goes for the deep fried baby squid. Try the black carrot cake (chai tow kway) from Heng Carrot Cake. The carrot cake is actually made from radish, despite its name. This dish is also a Singapore favorite. Part II For the more adventurous eater... or eater who has tried all the standard stuff and just wants general good eats. I should also note that every Singaporean seems to judge himself as the ultimate foodie and knows best about where to get local dishes. With hundreds upon hundreds of local food stalls to choose from, "the best" becomes a highly personal thing. There really isn't a right or wrong answer. Eat what you like! Girl this is an awesome post and it's got my appetite revved and ready for my trip back at the end of the year. Will you ever do a post on the higher end, locally owned restaurants anytime soon? I'd love to get your perspective on all the new places. Oh and I'm sending this list to some friends who are stopping in SG for a couple of days. Thanks for your great timing! @DubbleGz Visit Singapore again! There was still so much we had to try! @Tabbie Thanks! It's always good to hear when posts stir up readers' appetites. I do plan to do a post on the higher end, locally owned restaurants in Part II, actually! I didn't include it on this Part I list, because I feel the first time visitor must experience local hawker cuisine before anything else--it's all so unique to Singapore! Also, there are way too many SG food lists that already (and only) do higher end restaurants. Pfft! This was like a feeding frenzy. Just went on and on with one beautiful dish after another. I am not familiar with most of these dishes, but what I wouldn't give to try them all. They look and sound delicious. I'm 100% with you on the local fare. Tyson and I try to describe hawker centers to people but it's just so hard to do so without actually showing. Hey do you know if the stall owners care if I take pictures? I need to chronicle as much of my trip as I can when I'm back next. @Arlene It IS a feeding frenzy for me out there! I love it all! @Tabbie I've found that Chinese stall owners are a little more shy, but overall everyone was very receptive to letting me take photos :) In fact, some of them beam with pride when I ask! It's quite touching. That reminds me, I forgot to add Roti Prata to the list. The guys there were thrilled to have their photos taken. This = me in 7 months. My main worry about my foodie trip to Singapore is getting "peanuted". I know they cook with peanuts in traditional cuisines and I'm not sure how to explain my allergy to the kitchens. I know! I'm probably worrying over something that won't be a huge deal but I don't want to spend my whole vacation sick! Do you have a negative reaction to MSG? Before I try your suggestions, I want to make sure I'm not gonna be sent into an MSG induced coma. Hi is there any light food or steamed food ? I cant eat oil !! Thanks !